Create any type of event in minutes, from both administrator and frontend of your website. Limited or unlimited number registrants. Fixed start date or a TBC (to be confirmed) date. Enable or disable registration (display only events). Use cut off date to stop accepting registration after certain date. Use registration start date to only accept registration from certain date. Registration handled on site or on external website. Private events: Users can only register for the event if they know event password. Featured Events: The events will be displayed on top of events list. Event can be assigned to multiple categories. Create locations/venues and assign it to your event to let your users know where your event will be organized on a map using Google Map or OpenStreetMap. Easy location/venue creation by dragging the marker on the map. When you move the marker on the map, the address of location will be updated automatically. Auto-complete/suggestion location address as you type. Display event location/venue on a event details page. Menu option to display location/venue information (name, address, description, image...) and all events from that location. Add/edit registration record, add more registrants into an existing group registration. Checkin registrants, download invoices, tickets, certificates if needed. Display your events on calendar to allow users to browse for events on selected Month, Week or Day. Support two types of Calendar: Monthly Calendar and Full Calendar. Super fast page load while events are fetched in a new Ajax process. Users can navigate easily to find events from the month, year they want. Support most popular frontend frameworks: Twitter Bootstrap 2, 3, 4. Adapt itself to work with any templates, so you can use any template you like. 5 layouts options to display events: Timeline, Default (list),Columns (grid), Table and events grouped by category. Configure your preferred payment gateways to receive payments from your registrants when they register for your event. The most popular payment gateways: PayPal, Authorize.net, Eway, Worldpay and Offline payment plugins come with the extension by default. Other payment gateways such as PayPal Pro, Stripe, 2Checkout, Payfast, Authorize.net SIM (Server integration method) , Mollie... are paid payment plugins, cost 24.99$. See Payment Plugins tab to see list of available paid payment plugins. Each event can use different payment gateways if required. Recur events daily, weekly, monthly, and set of dates. Each child event is an independent event with it's own registrants, registration form, tickets. We could be proud to say that we have the smartest solution for multilingual in Joomla!. If your site is a multilingual website, you can translate everything in Events Booking(categories, events, form fields, email messages, language items...) to all the used languages. The price which registrants have to pay while registering for your event can be configured in many different way. Single Price: A cost is applied to each participant/user registering to the event. Group Registration Rate: Determine price for each user depends on number of group members. Fixed Group Pricing: Fixed price for whole group, not depends on number of group members. Early Bird Discount: Get discount if register before certain date. Members Discount: Give discount for users have account on your site and belong to the selected user groups. Each user group can have different discount amount if required. Bundles Discount: Get discount if registering for all selected events. Late Fee: Charge additional fee if users register after certain date. Create coupon codes to give discount to registrants whenever you want. Discount Type: Fixed Amount or Percent. Coupon can be assigned to all or selected events/categories. Limit number of times the coupon can be used. Limit number of times the coupon can be used by each registrant. Specify duration (from date - to date) a coupon can be used. Export/Import coupons to/from CSV/Excel file. Batch Coupons: Generate any number of coupons with single click. Individual Registration allow registering for one user. Group Registration allow registering for several users in a group. With group registration rate setup, admin can give discount for group registration base on number of group members: the more members in group, the more discount. Shopping Cart allows adding any events into cart and register for multiple events within one checkout. Create custom fields to collect any information you want from your registrants. Support 17 field types: Text, Url, Email, Number, Tel, Range, Textarea, List (Select), Checkboxes, Radio, Date, Heading, Message, File, Countries, State, SQL. Each custom field can be assigned to all, one or several selected events (or categories). Conditional Fields: Show hide a custom field base on selected value of another custom field. An unique, very powerful feature of Events Booking allows you to charge registrants different registration fee base on what they choose/enter on registration form. 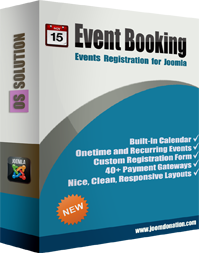 It makes Events Booking become very flexible and can handle almost all kinds of registration fee calculation. Single selection (Radio/Single Select). For example, registrant type with 3 options: Adult 100$, Student 90$, Children 30$. Multiple selections (Checkboxes/Multiple Select). For example: Lunch(+100$), Wifi (+10$). Text fee field. For example a textbox to allow entering number of tickets, each ticket cost 50$, if registrant enters 2 into that textbox, he will be charged 100$. Setup fee formula using math operators +,-/*,/ to calculate fee base on muliple custom fields. If it is needed, you can define any number of ticket types for your event. Registrants can select quantity for each ticket type they want to purchase for their registration. Each ticket type can have a different price and capacity available for purchasing. You can set maximum number of tickets which registrants can purchase for each type. Option to collect member information for each purchased ticket. Registration will be disabled for an event when no ticket types left for purchasing. Send up to 2 reminder emails to registrants X-days before/after event start date. You can config the system to send PDF tickets to registrants when they register for your events. Ticket layout is configurable with background image and HTML code. Each event can have it own ticket layout if required. Use QRCODE in ticket for checking-in registrants using mobile applications. Tickets PDF can be configured (on/off) per event. Generate PDF invoices and send to registrants for paid registrations. Invoices can also be downloaded from registration history. Invoice format is configurable, each event can have it own invoice format if required. Configure the system to allow users with proper permission to to submit, manage [their own] events, registrants and locations from frontend of your website. If enabled, registrants of an event can cancel their registration before certain date (setup for each event) to allow other users to register to replace that slot. Enable deposit payment for an event will allow registrants pay upfront fee (determined by admin) while registering and pay remaining fee later (online payment or manually at the event). Organize your events cross infinite categories and subcategories. One event can be assigned to one or multiple categories. Add agendas, speakers, sponsors for your events and have these information displays nicely on event details page. Easily find, translate, change language items from administrator area of your site instead of having to edit language files and change it. Support synchronizing registrant's data with Joomla! user, Membership Pro and third party extensions includes: Community Builder, Jomsocial, EasySocial, EasyProfile. Assign registrants to Joomla! user groups you want for each event so that access to resources (articles, documents...) restricted by ACL. Allow assigning registrants of each event to selected mailing lists in ACYMailing and Mailchimp so that you can send newsletters to registrants whenever you want. Register registants automatically to selected events when they register for a certain event. Share your events on social networks such as Facebook, Twitter, Google+, Linked In... to get attention from more people. Allow users to save event to personal calendars: Google, Yahoo, Outlook calendar. Easily updating to latest version from within administrator area of your site within single click. This payment plugin in allows you to accept payments via Authorize.net SIM (server integration method)payment gateway in Events Booking extension. This plugin allows you to use Moneybookers payment gatewayfor processing payment in Events Booking extension. This plugin allows you to use First Data Connect Gateway (http://www.firstdata.com/product_solutions/ecommerce/global_gateway/index.htm) payment gatewayfor processing payment in Events Booking extension. This plugin allows you to use iDeal Molliepayment gateway for processing payment in Events Booking extension. This plugin allows you to use Securepaypayment gateway for processing payment in Events Booking extension. This plugin allows you to use Alertpay payment gatewayfor processing payment in Events Booking extension. This plugin allows you to use Payfast payment gateway (www.payfast.co.za) for processing payment in Events Booking extension. This plugin allows you to use FirstData E4 payment gatewayfor processing payment in Events Booking extension. This plugin allows you to use IPay88 (a Malaysia payment gateway) payment gateway for processing payment in Events Booking extension. This plugin allows you to use Molpay payment gateway for processing payment in Events Booking extension. This plugin allows you to use PagSeguro (a Brazil payment gateway) payment gateway for processing payment in Events Booking extension. This plugin allows you to use Stripe (https://stripe.com/) payment gateway for processing payment in Events Booking extension. This plugin allows you to use Braintree payment gateway (https://www.braintreepayments.com) for processing payment in Events Booking extension. This plugin allows you to use CCAvenue (http://www.ccavenue.com) payment gateway for processing payment in Events Booking extension. This plugin allows you to use FirstData Payeezy payment gatewayfor processing payment in Events Booking extension. This plugin allows you to use First Data Link Point payment gateway for processing payment in Events Booking extension. This plugin allows you to use CardSave (https://www.cardsave.net/) payment gateway for processing payment in Events Booking extension. This plugin allows you to use Merchante Solutions (https://www.merchante-solutions.com/) payment gateway for processing payment in Events Booking extension. This plugin allows you to use Monetaweb (https://www.monetaonline.it) payment gateway for processing payment in Events Booking extension. This plugin allows you to use Monsterpay (https://www.monsterpay.com) payment gateway for processing payment in Events Booking extension. This plugin allows you to use Netbanx (http://www1.netbanx.com/) payment gateway for processing payment in Events Booking extension. This plugin allows you to use Netaxept (http://www.betalingsterminal.no/Netthandel-forside/Teknisk-veiledning/Overview/) payment gateway for processing payment in Events Booking extension. This plugin allows you to use PaymentExpress PX Pay (https://www.paymentexpress.com/) payment gateway for processing payment in Events Booking extension. This plugin allows you to use PaymentExpress PX Post (https://www.paymentexpress.com/) payment gateway for processing payment in Events Booking extension. This plugin allows you to use Payway (https://www.payway.com.au/) payment gateway for processing payment in Events Booking extension. This plugin allows you to use PIN (https://pin.net.au) payment gateway for processing payment in Events Booking extension. This plugin allows you to use Saferpay (https://www.saferpay.com/) payment gateway for processing payment in Events Booking extension. This plugin allows you to use Securepay DirectPost payment gateway for processing payment in Events Booking extension. This plugin allows you to use TargetPay (https://www.targetpay.com/) payment gateway for processing payment in Events Booking extension. This plugin allows you to use Buckaroo (http://www.buckaroo.nl) payment gateway for processing payment in Membership Pro extension. This plugin allows you to collect creditcard information and process payment offline in Events Booking extension. This plugin allows you to use Elavon CONVERGE payment gateway for processing payment in Events Booking extension. This plugin allows you to use PayU Latam (http://www.payulatam.com/) payment gateway for processing payment in Events Booking extension. This plugin allows you to use Sofort Überweisung (https://www.sofort.com/) payment gateway for processing payment in Events Booking extension. This plugin allows you to use Squareup (https://squareup.com) payment gateway for processing payment in Events Booking extension. This plugin allows you to use RedSys (http://www.redsys.es) payment gateway for processing payment in Events Booking extension. This plugin allows you to use Billplz (https://www.billplz.com) payment gateway for processing payment in Events Booking extension. This plugin allows you to use PayU (https://payu.com) payment gateway for processing payment in Events Booking extension. This plugin allows you to use PayUmoney (https://www.payumoney.com/) payment gateway for processing payment in Events Booking extension. This plugin allows you to use PlugNPay(https://www.plugnpay.com) payment gateway for processing payment in Events Booking extension. KILIX is a professional Multipurpose Joomla Template with unlimited endless posibilities suitable for any kind of business, corporate, blog/news/mag, creative/digital agencies, shop/education/membership site etc.